We have conceded the two for one deal is here to stay. It’s everywhere and is now a part of the hospitality mid week entertainment fabric. For many venues it is great as a short term “shout out” to the market that we’re here and open for business. But the big mistake hospitality managers make is a lack of any exit strategy or conversion initiative. 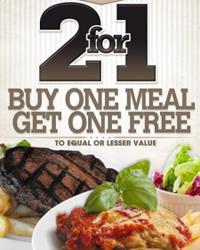 Most introduce the “two for one Tuesday” and it’s still there in its original form 12 months later. That can’t be good for business? Let’s say that the cost of plating a meal is $7.00 (no labour in that). That means that you would normally sell the meal for $22 if you wanted a 65% gross profit margin ($22-GST ($2) = $20. The profit margin after GST is $13 which is 65% of the revenue from the sale of $20). If you sell 20 covers then the gross profit of the meal will be $260. That’s normally enough to cover wages and consumables and leave a 15% surplus. But come Tuesday when it’s effectively half price, the number of sales of the item would need to increase by 400% to even go close to providing a return on the initiative. The examples above show that you’d need to sell 100 discounted covers to give about the same gross profit as the 20 full priced meals. That’s even before you take any account of the extra staff you have to roster for the sitting. Worse still, a two for one offer on a small range of meals can even drag a potentially full price customer to the cheaper options. So you’ve lost that margin too. “What about the beverage sales?” you might ask…That’s a fair point. You’d want to make sure that the normally cautious “non-drinking Tuesday crowd” hit the bar pretty hard to recover the margins lost. And then there are the poker machines. Granted, every extra $1 in the machines will provide a healthy margin. But if a two for one food offer is what you do to get players to come to your venue, you’d better be pretty sure of that. • How long does it run for? • Where is the conversion to beverage and gaming? • Can we spend our money better on other promotions? • What impact does it have on the Chef and the kitchen staff? • and more, right up to a full review of your catering operations. Contact us and speak with a DWS consultant to find out how we can help you or email your enquiry direct to Geoff Wohlsen.